Could artificial intelligence in trading become the new normal? Advances in technology and new standards surrounding automated trading are pushing us ever closer to transforming the industry. If this sounds very much like a science fiction movie, we can assure you it is not. 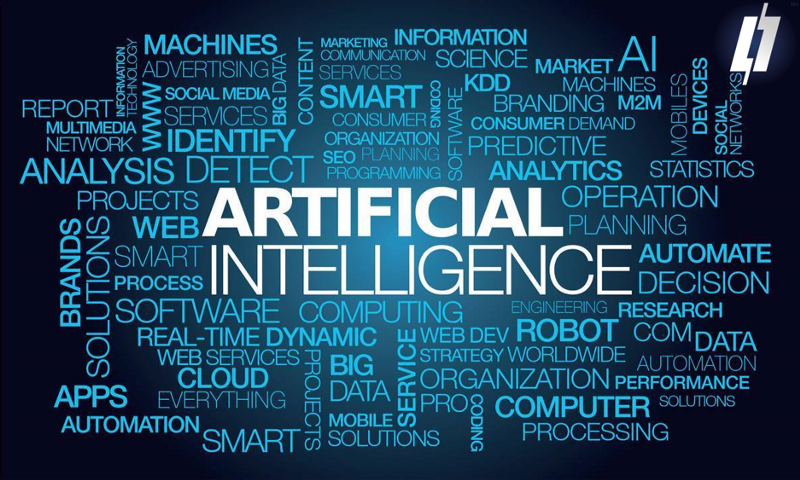 In fact, artificial intelligence (AI) is already being utilized by banks, but its going to take a little longer for people to catch up to the idea that their investment is as safe, if not safer than it would be if their investments were handled by humans. An analysis by Accenture indicates that between 2018 and 2022, banks that invest in AI and human-machine collaboration at the same rate as top-performing businesses could boost their revenue by an average of 34 percent. AI’s application is proven to improve efficiencies or customer outcomes and the software-development team at Level01 is working hard to achieve a human-machine collaborated future in derivatives trading — to help people trade better, with ease and peace of mind. From helping investors to assess true market value of the contracts to enabling them to continuously update their bid or offer price relative to the implied fair value by FairSense, plenty of functions were built in to support human-collaborated trading, rather than substituting it. Introducing these features on a sleek user-friendly app is a strategic step-by-step approach to help the public get used to a whole different way of investing on an efficient and trustworthy Peer to Peer Derivatives Market platform like Level01. “People will experience trading at speeds, liquidity, freedom, accountability and transparency that have never been available before” says Vysniauskas. Those that find it hard to believe, can now experience trading on Level01 without limitations traditionally set by brokers, who would force their clients to accept their given price, disallow clients from dictating the best execution and insist that clients to trade at a ‘spread vs. mid’ (clients have no power to negotiate the level of spreads which they pay). The level of freedom granted to users on Level01 is enticing and highly persuasive. “On the Level01 Derivatives Exchange platform, retail investors (or users as we call them) can trade against multiple peers or brokers, and this enables them to find best execution available,” says Vysniauskas. “Also, the ability to specify a fixed spread to fair value of an instrument could potentially reduce trading spreads significantly for large investors.” The practicality of this feature though may not fit small investors though, because leaving fixed bid or offer prices without continuous adjustment would be risky in markets where sudden movements are common. “That is why we built Level01 to give users the freedom to continuously update their bid or offer price relative to the implied fair value by FairSense, this is so that if the trade is not a match, the bid or offer price is updated continuously as market moves to ensure that it is always priced competitively relative to the most recent fair value” adds Vysniauskas. How does FairSense work to Level01 user’s advantage? 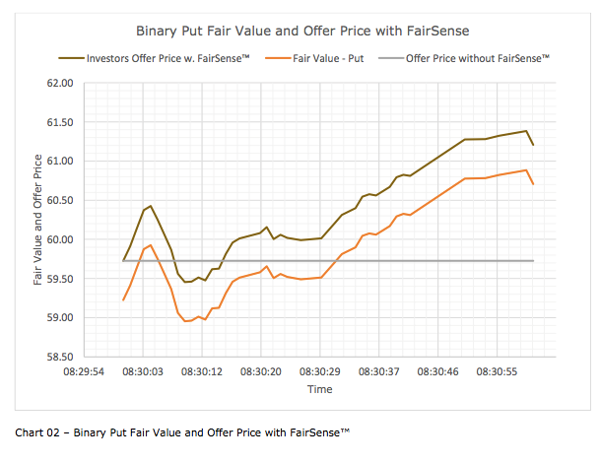 For the purposes of explaining how FairSense AI helps users on Level01, we take a look at this case study of a Binary Option Example on EUR/USD Forex Pair. A 10-minute binary put option is being offered at a $59.73 (fair value +$0.50). The order is not filled or matched almost immediately, and after 4 seconds, the EUR/USD spot price has moved by 1.5 pips and the fair value has not moved above the investor’s offer price. In this case, a contract is being offered below fair value. Now take a look at Chart 01 below. 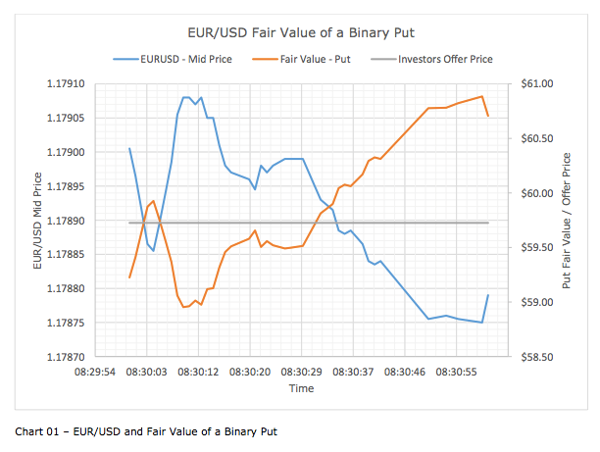 You can see that the relationship of the fair value of an option with the spot EUR/USD price. You can tell that the fair value is highly dependent on the spot rate. Thus, if a retail investor submits an offer to an exchange, it might be filled at a time when it is already below the fair value — an undesirable scenario for investors. Such scenarios will stop investors from submitting further offers to the exchange. To resolve this common problem, Level01’s FairSense AI enables all investors to quote ‘relative offers’ to FairSense’s fair value. This allows investors to simultaneously compete for the best offers without imposing them with a requirement to have their own algorithms for price estimation and having them continuously updating the quote manually. In many ways, having AI as the norm will become essential to creating investment outcomes that are optimized for every type of investor, truly transforming the way trading is done. With an advanced Blockchain platform, AI and inbuilt frameworks that are designed to favor the user, Level01 will shape the future of automated trading on its Peer to Peer Derivatives Exchange at scale and speed that the world will come to marvel. Machine learning and other techniques make it easier to identify patterns that might otherwise not be detected by the human eye. beside that they have no emotions that can affect their decisions. so by including the AI in the trading will eliminate the weaknesses from the trading and increase the chances of the success.